Almeria’s Alcazaba, a Moorish castle perched above the city, overlooks the neighborhood of La Chanca. It is a historically impoverished zone made up of small dwellings built into the hillside on the outskirts of the city. The inhabitants painted their homes using whatever ingredients were available, resulting in a multicolored patchwork. Ruins still remain of a nineteenth century lead mining and transport operation that ran down the mountain to the nearby port. La Chanca has long been home to a diverse population, including fishermen and their families, a strong community of gypsies, and, more recently, immigrants from Morocco. The panoramic image above is a composite of several photographs I took from the far tower of the Alcazaba about 11am on a Saturday in August. A version of the image with embedded explanatory notes and links is available on my Flickr page here, and a larger size image with greater detail is available here. Carlos Perez Siquier began photographing the streets and people of La Chanca in 1957. He visited the neighborhood on weekends while free from his day job at a local bank. With limited funds, he sometimes used discarded pieces of unexposed film from movie productions in Almeria. Perez Siquier explained in an interview years later that his intent was not to denounce the conditions of La Chanca or conduct a sociological study, but simply to show the people as they are and reveal their dignity among difficult circumstances. Perez Siquier continued to return to La Chanca over the years. His early photographs, in black and white, are scenes from neighborhood life lived largely in the streets. Children playing, a laughing wedding party, a couple carrying an oversized wardrobe, or a crowd gathered around a tightrope walker. A few of the frames focus on stark abstract shapes, patterns created by hanging clothes and shadows on the ground, a black umbrella hanging upside down against a white wall, or a series of white chimneys rising out of the eroded rock wall. He later began using color film, showcasing the varied palette of the painted houses. In one series of images, he hones in on multicolored layers of peeling paint emerging from walls and doors. Perez Siquier’s early images were part of a new photography movement emerging in Spain during the 1950s and 60s. The new photography rejected the officially sanctioned images which romanticized the Spanish landscape and traditional village life. Instead, they favored realism and focused on marginalized communities and the urban periphery. 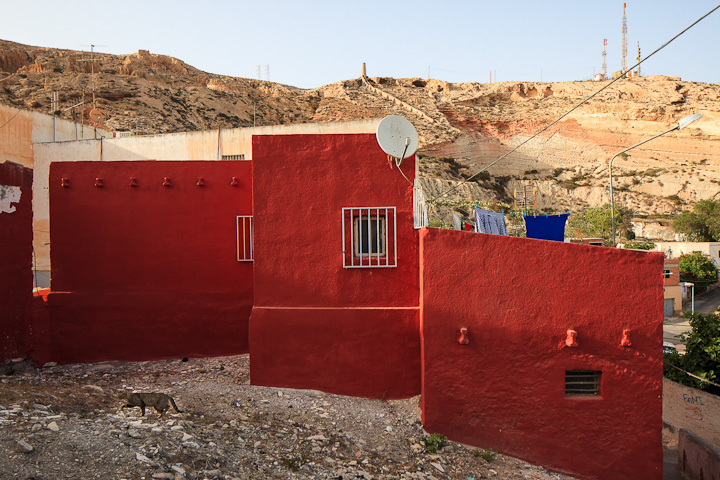 Along with Madrid and Barcelona, Almeria became a locus for the photographic vanguard. Perez Siquier’s images of La Chanca first appeared in Afal, an influential photography magazine published out of Almeria. Goytisolo’s book was published covertly in Paris and for years was not openly available in Spain. When a Spanish edition finally emerged in 1981, under a newly-democratic government, one of Perez Siquier’s images appeared on the cover. Local singer/songwriter Sensi Falan includes more outstanding views of La Chanca in her recent music video.